In Stick Dog Wants a Hot Dog, Tom Watson's hilarious sequel to Stick Dog, Stick Dog returns with the same crew of friends, and they're hungrier than ever. As the dogs embark on their quest for hot dogs, they learn they're not the only ones on a mission—a band of raccoons are following close behind, and they're ravenous, too! 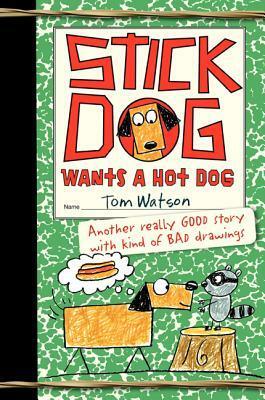 In this second book, Stick Dog and his four frien In Stick Dog Wants a Hot Dog, Tom Watson's hilarious sequel to Stick Dog, Stick Dog returns with the same crew of friends, and they're hungrier than ever. As the dogs embark on their quest for hot dogs, they learn they're not the only ones on a mission—a band of raccoons are following close behind, and they're ravenous, too! In this second book, Stick Dog and his four friends, Poo-Poo, Mutt, Stripes, and Karen, must execute a master plan for stealing hot dogs. The closer they get to the hot dog vendor, the more difficult their mission becomes. With the same hilarious antics, the five dogs are met with many challenges along the way, including having to distract the frankfurter guy and Karen getting locked in a human's house. No matter what, these dogs have their eyes—and stomachs—on the prize.